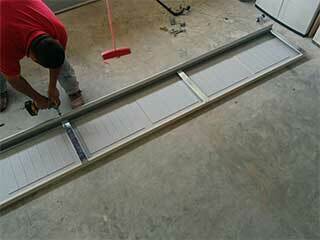 The many complex parts of a garage door system can develop a wide range of problems. We work hard to ensure that our customers never have to deal with these problems for long; whether you have a broken torsion spring or a set of maladjusted safety sensors, our team has the skill and experience to quickly solve the problem. Door springs wear out over time. Even though they’re designed to last, a garage door can be used upwards of a thousand times per year, and most springs only have a service life of a few thousand cycles. Eventually, they’ll wear out and need to be replaced. This should never be done by untrained personnel; our technicians will quickly and safely remove the old units and install new ones, with minimum hassle. There are all kinds of attractive garage doors on the market today, from handsome authentic real-wood doors to sturdy steel ones. Our team installs all makes and models of door, and work with the best manufacturers to bring our customers the highest industry quality. If you’re thinking of upgrading your existing door, contact our team today - they’ll happily provide guidance to help you find the perfect solution. A complicated machine like a garage door tends to develop problems as parts wear out. Rollers can corrode, cables can fray, wires can be torn and safety sensors can be knocked out of alignment. Regular upkeep allows our technicians to catch these issues before they develop into bigger problems. It can also help to prevent breakdowns. Our team applies lubrication to all moving parts, as well as checking for any signs of wear or damage in order to extend the service life of your door. For fast and reliable service, contact Garage Door Repair Roswell today. Our team is on hand to help - get in touch today to find out what we can do for you.